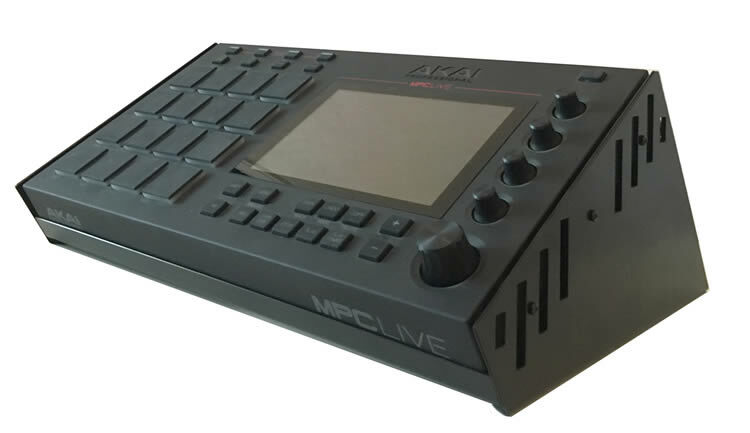 Unlike the MPC X, the MPC Live unfortunately doesn’t have any kind of tilting screen which makes screen viewing a bit awkward while sitting at your desk. If you’d rather not spend your life standing hunched over your MPC Live then it’s worth investing in a stand that will tilt the entire unit to a more comfortable viewing angle. Angle of tilt is important but so is stability as you’ll be continually bashing the pads and tapping the touchscreen. There’s also a larger version meant for laptops, but I find this smaller one is perfect as it takes up very little desk space. Most generic laptop stands will probably work with the MPC Live to some degree, although I find the narrow ones tend to be a bit unstable. 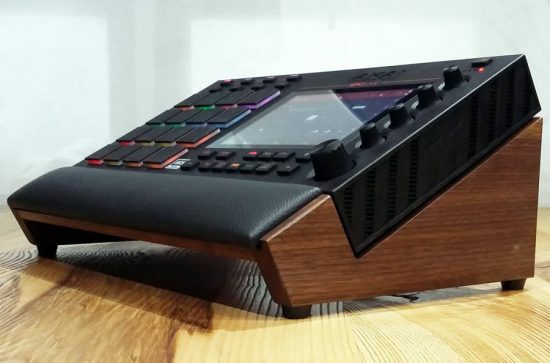 If you’ve discovered a good stand for the MPC Live, let us know in the comments. 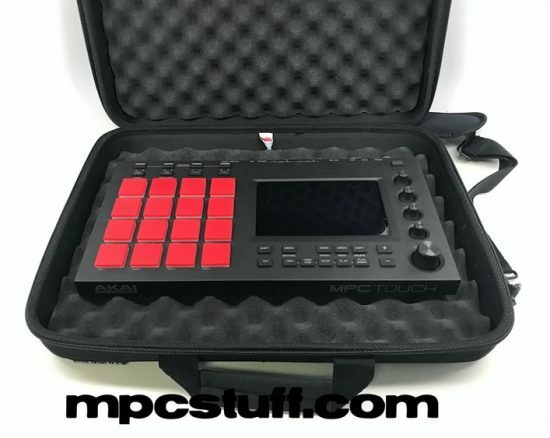 The battery-powered MPC Live is the perfect portable MPC but you’ll definitely want to ensure it’s fully protected while you carry it about. Just remember that you’ll probably need to carry around other gear and accessories as well (e.g. 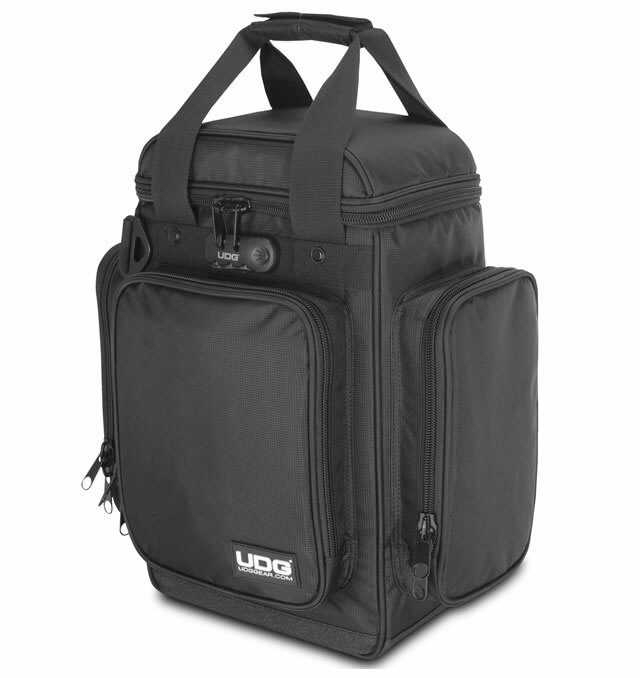 headphones, PSU for recharging, MIDI keyboard etc), so you might prefer a bag that has room for these items as well. 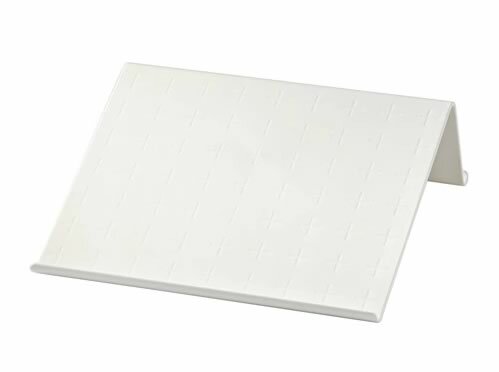 Similar options are available from Magma and MPCStuff – the MPCStuff case is bigger as it’s more of a universal case suitable for most MPCs (just cut the internal foam padding to size). For the MPC Live this means you’ll have some extra room to cut out a space for accessories (you might be able to fit the PSU in there). 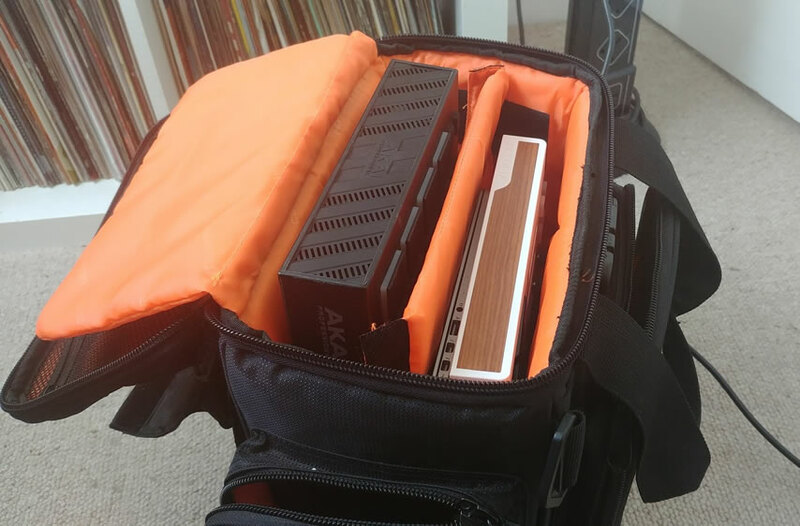 This holds my MPC Live, macbook pro, a small MIDI keyboard (Arturia Minilab 2) all the PSUs I need, disks and I often manage to cram in my lunch as well! It’s well padded and can easily be carried on your shoulder or via handles. You can use all the heavy protection in the world, but there’s no escaping the fact that merely ‘using’ the MPC Live leads to all sorts of fingerprints and grubby marks real quick, especially on those black matt pads. If this bothers you then try using sticky tape or a lint roller to quickly clean up the pads. 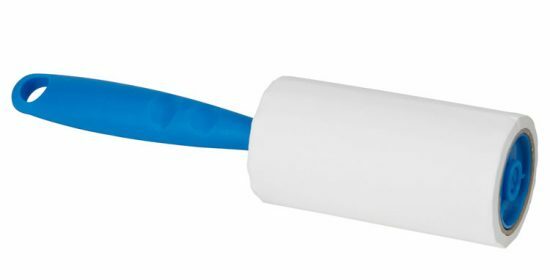 Any lint roller will do, but once again Ikea come up with one of the cheapest options. Just roll it across the pads a few times and they’ll clean up perfectly. To clean the rest of the unit I’ll usually use a microfibre cloth, or if things are real grubby I’ll use a (slightly) damp cloth first. Finally you might want to think about protecting that screen from scratches so consider investing in a dedicated MPC Live screen protector or buy a generic tablet screen protector and cut it to size. The MPC Live ships with an internal 16GB drive which stores the included sound library which leaves a few GB of space spare. However it’s currently not possible to bulk transfer your own files to this drive and you also can’t connect to his drive via USB for backup purposes, so this, in my opinion, effectively makes this 16GB drive fairly useless for storage of your own projects and sound library, so I do advise all MPC Live owners to invest in a decent disk to use with their MPC Live. The MPC Live supports USB disks (e.g. USB sticks, portable USB drives, even desktop USB drives) via the two USB ports at the back of the unit, an SD card and an internal SATA disk. Whichever option you choose all of these drives can be fully accessed while your MPC Live is connected via USB to your computer, so backing up and file transfer is really easy and quick. It’s really up to your own preference which one you go for, just make sure you get a quality, reliable disk. To retain portability, I would avoid using bulky external USB drives and instead use low profile USB 3 drives, as detailed in my ‘MPC Projects Lowdown‘ guide. SD cards are also great as these are also neat and tidy at the back of your unit and also mean you don’t sacrifice any USB ports. However, an internal SATA is probably the best long term option, especially if you have a huge sample library to transfer. If you go for this option I would highly recommend getting an SSD drive as they are quiet, more robust and fast. 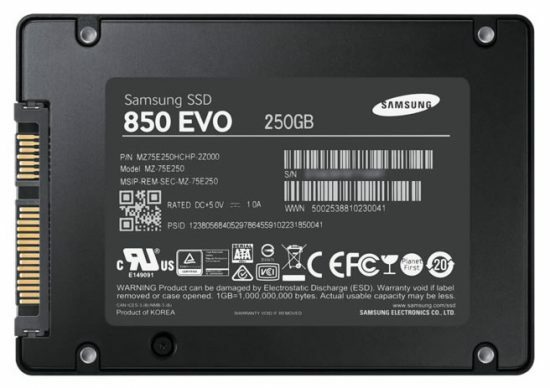 I’ve always used Samsung SSD drives in my computers and found them reliable, however always remember that all drives can/will eventually die so always ensure you backup on a regular basis. The MPC Live pads are great for finger drumming but even ‘Pad Perform’ mode can’t replace playing melodic parts on a proper set of keys. And with the recent 2.2 update you can easily map your knobs, sliders and dials from any third party controller to most MPC Live software functions. 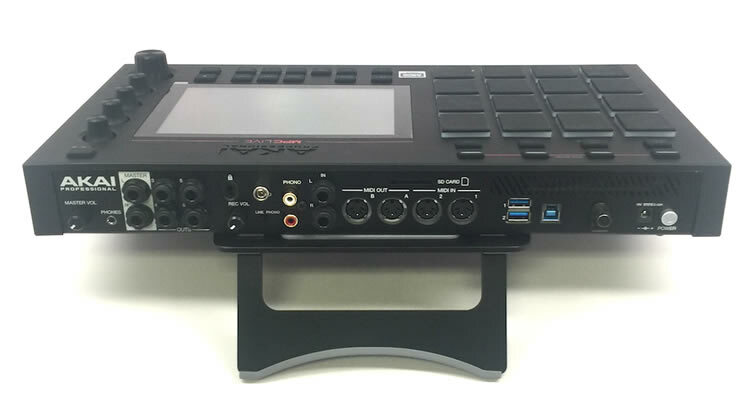 The MPC Live accepts MIDI connections via USB, traditional MIDI port and even bluetooth so there’s plenty of options. Not all USB keyboards are guaranteed to work, but generally speaking a ‘class compliant’ USB keyboard (i.e. 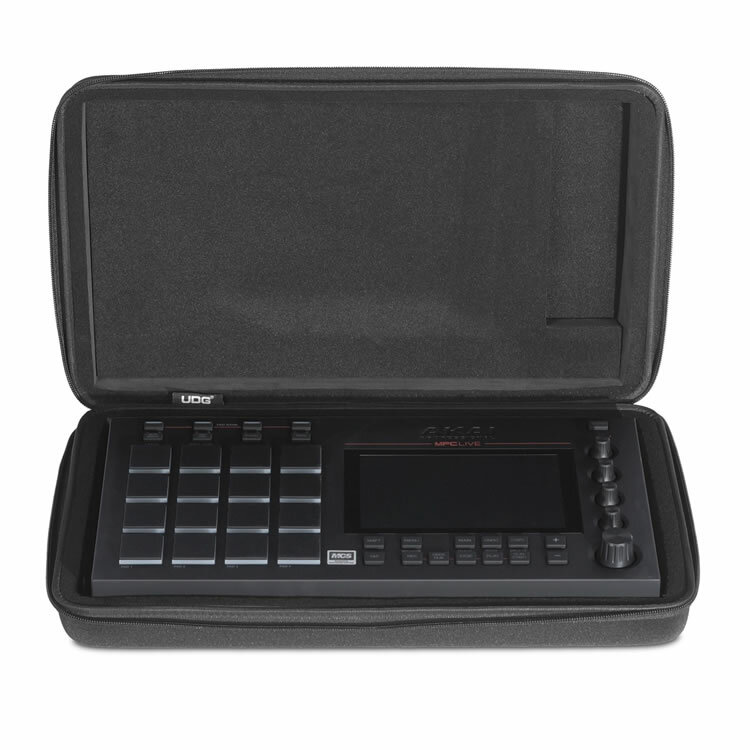 one that doesn’t need drivers) should just plug into the USB ports at the back of your MPC Live and immediately be recognised. Once plugged in, fire up a keygroup program in your MPC Live and start playing it using the keys on your keyboard. I am currently using an Arturia Minilab 2 which is a well built, compact budget keyboard controller which takes up minimal desk space. It’s powered entirely by the MPC Live itself (via the USB connection) so also makes a great option for travelling. It only has 25 keys mini keys though, but the action is pretty good so I find it’s a great compromise for programming keyboard parts on the go. 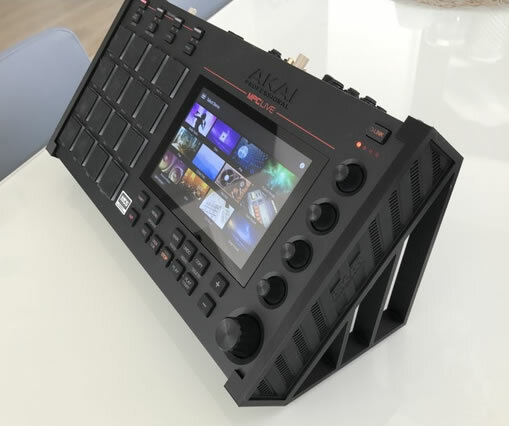 As a bonus the knobs/dials are fully mappable so you can use those to change things like effects or mixer settings within your project and Akai even provide a pre-mapped ‘global’ template for use in the MPC Software (templates are not available in standalone mode). 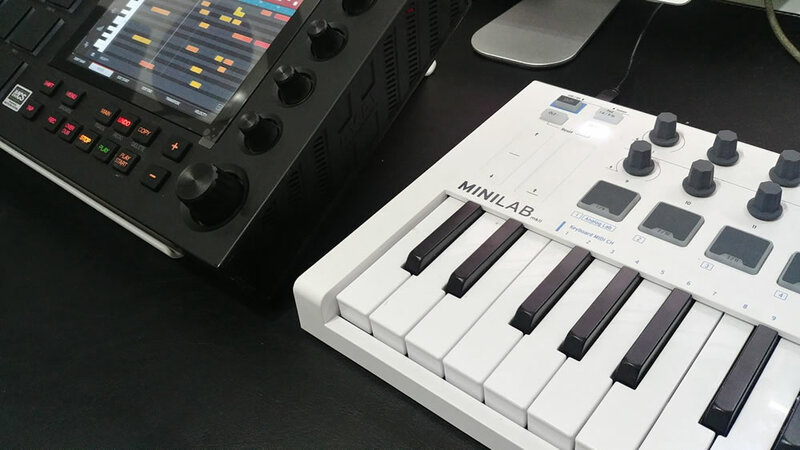 However if you need more keys or ‘weighted’ (or ‘semi-weighted’) key action, then take a look at some of the other options out there, such as the Alesis VI Series. 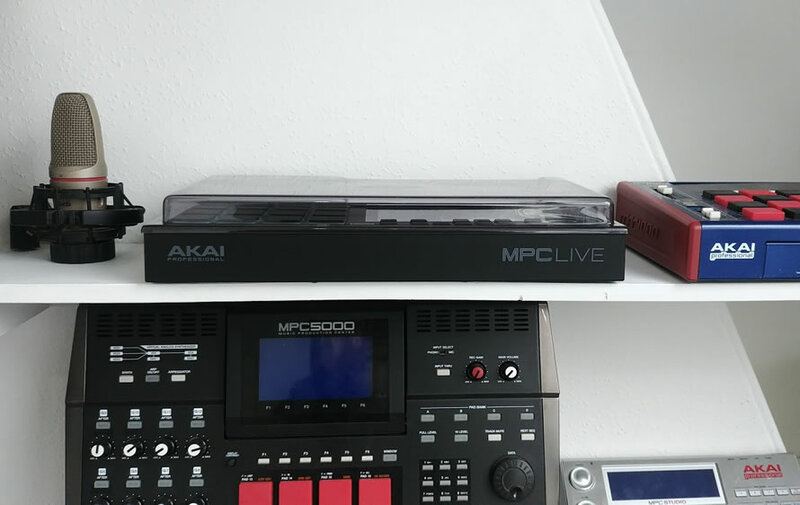 After investing so much into your MPC Live set up, don’t forget to spend a bit more cash on a quality, hands-on course that will teach you everything you need to know about making music with your MPC. 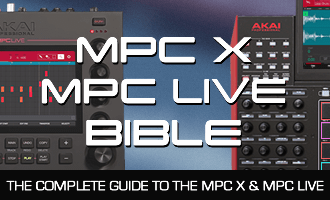 My bestselling ‘MPC X & MPC Live Bible‘ is the most comprehensive and up-to-date MPC Live/MPC X course available today, with over 600 pages of step-by-step MPC Live tutorials; it also includes all the project files used in each tutorial so you can recreate everything in your MPC as you progress. Perfect for beginners but also jam packed with advanced tips and tricks for more seasoned MPC users – download a free MPC Live tutorial from the book here. Can the Live use a USB Keyboard to trigger its internal samples when its not hooked up to a computer? Thank you? yes it can. as long as the usb keyboard is “class compliant” it should work with little to no problems. you’ll have to look at the Specs on the usb keyboard to make sure if it’s class compliant, but most are these days. you can even hook up other pad/fader/knob controllers to the MPC Live. I’m interested myself as to how well they integrate together though. I don’t have the MPC Live. Hi thanks, great info here. With the recent update 2.3 which midi controller would you recommend for in standalone mode & are motorised faders a must have for live use?